Tiffany & Co the jeweler saw its sales and profit exceed market expectations thanks to strong demand for high-end solitaire and fashion jewelry in its first full three-month period under new CEO Alessandro Bogliolo. Tiffany, whose traditional solitaire and engagement jewelry, which was very popular amongst the baby bombers, has offered fashion jewelry at lower prices the last year after numerous quarters of dropping sales in that category. Price-conscious shoppers today, in particular millennials, have drifted toward stores and online sites of newer members of the industry like Pandora from Denmark and Blue Nile an online jeweler, which sell sterling silver ware, starting at $35, have placed strong competitive pressure on Tiffany. The upscale New York based jeweler in response has refreshed its fashion jewelry lineup to include less expensive items, hired Reed Krakoff the former creative chief at Tapestry to be part of its executive team and unveiled new designs in its high-end line such as Tiffany Hardware and Tiffany T collections that feature pieces like an 18k rose gold link bracelet for $12,000. 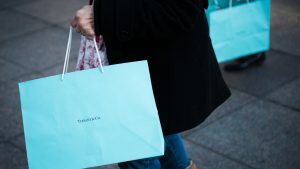 Tiffany said its sales in the Americas, its largest overall market, were up 1% during the three-month period, while its sales in Asia-Pacific surged by 15% thanks to strong demand across mainland China. Overall, revenue increased by 3% to end the quarter at just over $976.1 million, said the jeweler in a prepared statement that accompanied its financial results. The company however, posted an unexpected drop in its overall same-store sales. Tiffany’s same-store sales were down 1% due to less spending by international tourists across the Americas, while analysts were expecting those sales to increase 0.02%. Tiffany, based in New York, posted an increase of 5.4% in net income ending the quarter at $100.2 million equal to 80 cents a share, for its quarter that ended October 31. Wall Street analysts were expecting profit for Tiffany to be 76 cents a share on revenue of more than $957 million. Asia-Pacific helped Tiffany as its same store sales were up 2% for the quarter, in comparison to a drop of 1.4% predicted by Wall Street. Shares of Tiffany’s were up as much as 2.1% prior to the opening bell Wednesday just after the quarterly report was released. Tiffany’s stock has increased by over 21% since the start of 2017. Tiffany also kept its sales as well as earnings guidance for its full year.